There is still SO much to do in this house (ah! So fun! it's hard not to go nuts over it), but I am pretty happy with the kitchen and dining area right now. Of course there are other things I'd like to add, but the major part of furnishing this space is done. It was a high priority for when we moved in (kind of need somewhere to sit when you eat). As you can see, the chairs are still white... it was the general consensus when I asked you guys, and it was a lot easier than painting them dark again. hah. I think I'm starting to like them white now, anyway. I just need some lighter seat cushions for the chairs - which apparently are hard to find. What, is it not practical to have white pillows to eat on? Who needs practicality, I say. Prettiness is where it's at. I'm not sure if I mentioned it before, but I got the table at Scott's Antique Market here in Atlanta, in the North building. Would you believe I'd never gone to Scott's before that time (about a month ago)? I have been wanting to go for a long time, but living in our condo, it really always felt pointless, because we didn't need furniture or anything. I guess I could've picked up accessories, but for some reason I never did. 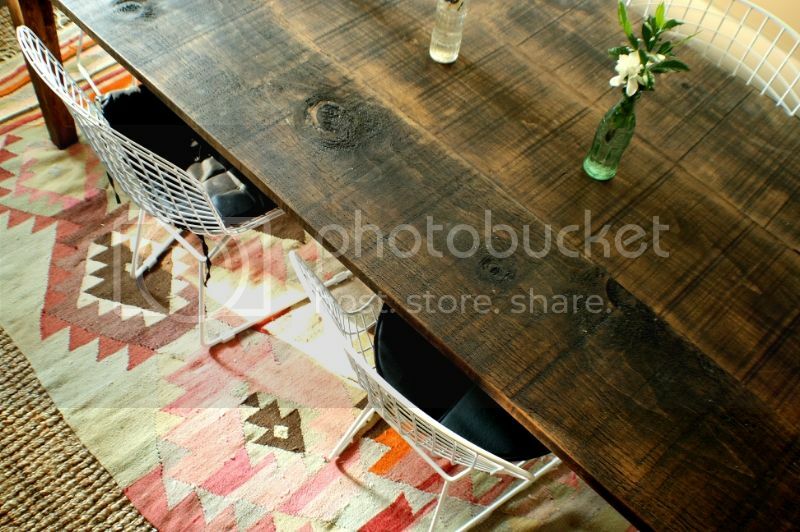 Anyway, I'm so happy with the farm table. I hung the old artwork from our bedroom in here for now, but it may change. I'd like to get a vintage sideboard or something to go on that wall under the artwork. It will have to be shallow, and I'm on the hunt. Also, we need some blinds and curtains, stat. I was researching blinds yesterday, but I haven't found any that I like that have the privacy liner in them! Lowe's sells only two types of blinds with privacy liners - one is a really light blonde wood, and one is a really dark wood. The medium ones don't have the privacy liners. I did find a DIY project online where you could add your own fabric to the backs of any bamboo shades, but I find that frustrating when you pay around $60 per shade anyway! I don't want to have to do surgery on my expensive shades to "make it work", you know?! Do you guys have any suggestions? We definitely need the privacy liner, since our's are on exterior windows that show to the street and right to our next door neighbors :) I did find an option online, but the website seemed a little shady, and made me nervous. I may just end up going with the dark versions of the bamboo ones from Lowe's. As for curtains, Ive been searching Spoonflower and found a few contenders. I love Spoonflower! As you may remember, I bought fabric there last summer, and made some curtains for our bedroom. I think this time, I'll go with a slightly higher quality fabric, though. The last one was fine, but it was a little thin for curtains. Right now, we have those paper temporary shades on all the windows, and they keep randomly falling off the window. So annoying, and so weirdly loud in an empty, echoey house. Scary!!! 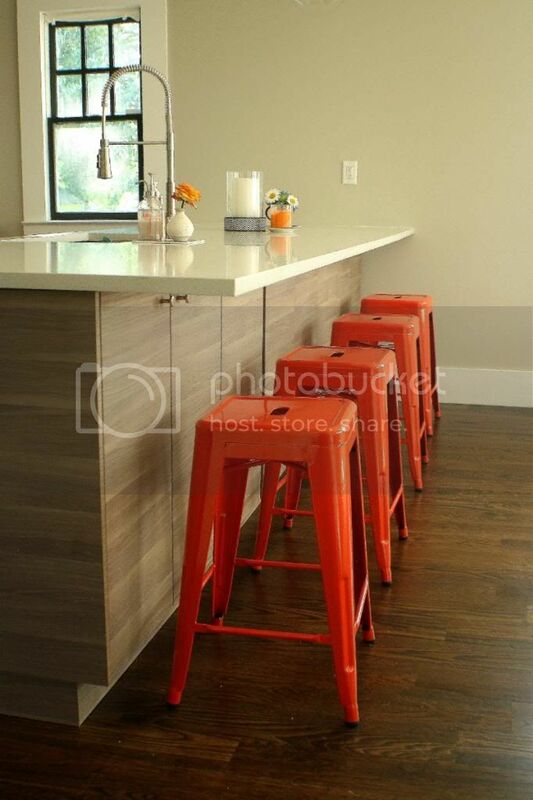 lastly, i am really loving the orange stools from overstock! they're the perfect height, and they're nice and sturdy. and: no assembly required. Ahhh. The chairs took about 45 minutes to put together, so i was quite happy when i opened the box to these babies and they were just stacked. Much easier. anyway, that's all for now - just a little house update! I'm a lurker, first time commenter... :) Love following the process of decorating and furnishing your new house. Are you doing one long outside mount shade? If so, the task of attaching the lining yourself wouldn't take all that long. ahhh, thank you katie! i'm doing individual shades :( I might end up lining them myself, if I can't find the right color combo, but I really really don't want to! yaaaay! cannot wait to see it in person! headed to JCP.com now... thank you! true! if i were a better seamstress! ugh! Also, there is an oval shaped bar cart coming up for auction at Braxton's in Loganville you might want to check out. It is super cute - just needs your customization. that is so cute!!! what is this auction thing? i'm so bad about stuff like that! I like to buy stuff NOW! haha. Oh it is a LOT of fun. I love the energy at some of the auctions we go to. We go to this one almost every time they have an auction because they are less than a mile from my house. I'm like you - an instant gratification girl! But, sometimes we find stuff we weren't looking for. I got an easel that would normally cost over $100 for $25. That's just one of the many things we've picked up. Couldn't you see that cart in your dining area with your bar supplies on it? Heck, I can see it there after you paint it a bright color! Anyway, you can do phone bidding or go view the item the day of the auction and leave your best bid and they will proxy bid for you. Or I could bid for you. Once you start going to good auctions, you will become addicted! KFD, check out this auction for this Saturday out in Madison. Several mid-century mod pieces including a MCM china cabinet, desk, bedroom set, etc. I'm in LOVE with your light fixture. Was it there? Do you know where it came from? 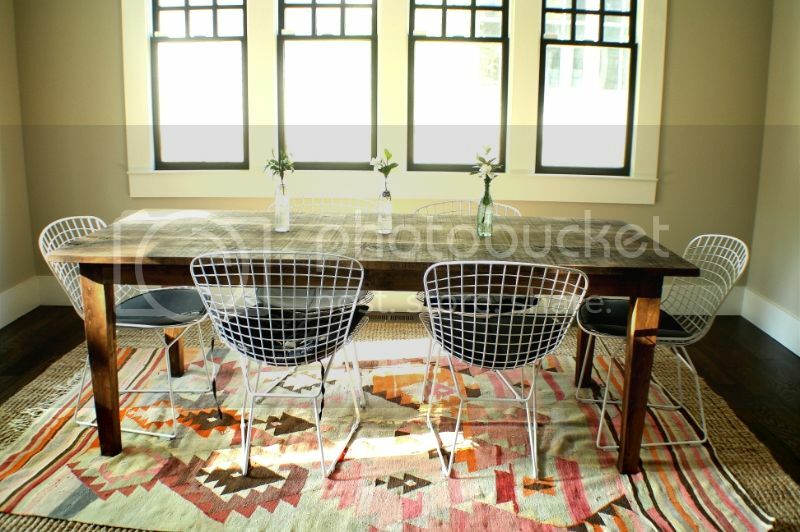 Hi, I like sunbrella for dining chair cushions. you can order it online at a discount. Our company guarantee the best quality of written papers because customer satisfaction is our main task Purchase essays at our custom writing company and get the best quality essays! There are only few students who can write without much of an effort sociology essay and they are truly the blessed ones. Hello! If you looking for best essay, and you need cheap service that satisfied your needs. Just click here for essay writing service. Love the design of your kitchen.The furniture you used is awesome.I also decorate my kitchen like this.You may explore more stuff to adecorate your home and kitchen through Beddinginn which provides all decorated product with discount coupon.You may save lots of money using promo codes. wow what a creative post. i enjoyed it. So good to read it. godaddy hosting 1$ webhosting available here. Thank you. It has to be a good thing to be here on this article and i was hoping for this info and then i have got many things from this article.Thanks for share this info and i am glad to be here on this article.